Good question. You’ll want to use SVUnit if you and your customers value defect free systemverilog code. Simple as that. 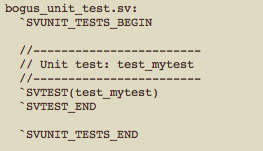 The SVUnit framework allows you to easily isolate modules, classes and/or interfaces in your designs and testbenches so you can kill bugs at a granularity that is most productive: the unit test level. It’s good for design and verification engineers. It’s also great for test-driven development if you care enough to prevent defects in the first place. On the other hand, if your customers like buggy code or you don’t think defect free code is worth the effort, then SVUnit is not for you. Download the latest version of SVUnit from GitHub by clicking the big blue button to the right. Run your new test with the simulator of your choice! For the full description of how to use SVUnit, you can check out the SVUnit User Guide. To connect with other users, ask questions and share SVUnit experience, join the SVUnit User Group. Everyone is welcome! examples/modules/apb_slave – an example for designers. This is a verilog APB slave module being verified with a set of simple read/write accessibility tests. examples/uvm/simple_model – for verification engineers building UVM components, simple model is a simple (perfect) reference. examples/uvm/uvm_express – this is a more elaborate example of building an UVM agent. You’ll find BFMs, monitors, coverage groups and an agent in this example with unit tests that take about 10 seconds to run. Don’t let the name fool you… uvm_express will help anyone using UVM! uvm/uvm_report_mock – learn how to verify your uvm_error and uvm_fatal testbench checkers by using the UVM report mock scoreboarding. I must confess I had my doubts in the beginning with respect to using SVUnit. I thought it would be painful to set up and use. I finally got over them, installed it and started using it. I was very pleasantly surprised. It took very little effort to become productive. After getting more accustomed to unit testing I do plan on trying out TDD. Thanks a lot for the great library and keep up the good work! Great to hear that you’ve come around! I think we verification engineers have grown used to so I’m always a bit skeptical as well when people suggest they have something that’s easy to use. Nice to know people are finding SVUnit *actually* easy to use ;). Can’t locate File/Which.pm in @INC (you may need to install the File::Which module) (@INC contains: /global/freeware/Linux/2.6/perl-5.20.2/lib/site_perl/5.20.2/x86_64-linux /global/freeware/Linux/2.6/perl-5.20.2/lib/site_perl/5.20.2 /global/freeware/Linux/2.6/perl-5.20.2/lib/5.20.2/x86_64-linux /global/freeware/Linux/2.6/perl-5.20.2/lib/5.20.2 .) at /slowfs/vgvips23/uditk/client_space/svunit/svunit-code/bin/runSVUnit line 28.
udit, looks like your perl install is missing the File::Which module. I’m using perl5 but I’m pretty sure that module is packaged with older versions. 3 options… move to a newer version of perl, install File::Which and stick with the version you have, or you could comment out lines 28, 117-121 or runSVUnit. ‘which’ is only used to make sure the simulator you’ve chosen is in your PATH. so it’s a safety measure that runSVUnit will still run without. hope that helps! I ran into this as well, and worked around it by downloading File/Which from CPAN, then installing it locally, because I do not have root privileges thanks to corporate IT. I’m using Perl 5.10, but do not have the flexibility to upgrade to a later version, again due to corporate IT. As it turns out, this module is not part of our standard Perl distro. I think it would be nice if releases do not require additional dependencies that the user’s environment might not have, and would have to either install these on their own or hack the SVUnit code to make it work. Perhaps these dependencies can somehow be bundled with the SVUnit release, and the SVUnit setup could set the PERL5LIB to add its lib to the search path, saving the end user some time to set up. thanks manning. I’ll look into removing the File/Which and getting what I need some other way. rather than trying to guess at what people might need and package it with svunit, I think I better just keep it simple and remove anything that causes trouble. thanks for chiming in. Unfortunately I run all my FPGA development flow in Windows 7 (not by choice). Is there a way to run svunit in Windows ? stefanie, this would be a good question to post to the user group: https://groups.google.com/forum/#!forum/svunit-user-group. I personally have no experience with windows. but I did help someone get going with cygwin. maybe others could help. I’ve used SVUnit under cygwin, but the problem was always the define for the SVUnit version, that is a string containing a space character. Cygwin gets problems because of this. I always had to patch the distro to remove this from the run script. The usage of absolute paths was also rather annoying because the (Windows) simulator expects different styles of paths than what cygwin provides it, so I had to create a wrapper script that mangles the paths. Do as Neil suggested and open a question on the user group and I can post the stuff I have in there. Where can I acces tutorial videos for SVUnit version 3.17? Also, Does it support simulator RivieraPRO? If so, do you have library support in order to use it with RivieraPRO?